The ergoBeads Hand Exerciser and StressBall is ideal for isometric hand strengthening and hand rehabilitation. 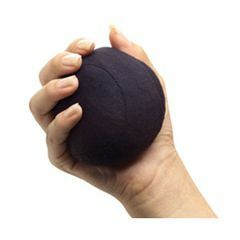 StressBall & Hand Strengthener The ergoBeads filling provides a gentle massage, while comfortably allowing your fingers to stretch and strengthen. Helps with managing and healing scar tissue. 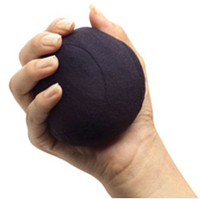 Also great for stress relief: squeeze, roll or play! Freeze your ergoBeads Ball and enjoy that cooling "aah" sensation. Get relief for your headache, neck, and wrist pain as well. IMAK ergoBeads are tiny plastic beads with a special smooth coating. They glide smoothly against each other so they easily conform to your body. This creates a massaging effect that increases your blood circulation -- promoting healthy muscle tissue. Very good at relieving age related tendonitis, and keeping dexterity in the hand. Not enough resistance for hand strength. Good for relieving end of day tension. I REALLY love this stress ball. Not only is it relaxing to squeeze and play with, but it's fun to toss back and forth between my hands, smoosh my hand on when it's on the table, and throw in the air and catch. The little plastic beads inside are the perfect texture and resistance and they feel great. I'm not sure how well this would work as an exerciser, because it doesn't have a whole lot of resistance, but it's the best stress ball I've ever had. It makes my stressful day 1000% easier. I use them to help with my anxiety and tension from being in Sales. They take the stress away! Easy To Use. Compact. Sturdy Construction. I've been using this product as part of my recovery from a boxers fracture. It's a simple but effective product to get the ligaments in my hand working again after 6 weeks in a cast. Compact. Easy To Use. Sturdy Construction. I like this ball because it gives with the beads that surround my arthritic hands. It feels so good! we bought this a while ago after i broke my thumb however my nine month old nephew has claimed it as his toy....is it safe if he chews on it? he hasnt punctured the ball itself im more worried about the beads inside. back in the day the beads used in most of these products contained something harmful if they were to burst in your mouth or on your skin.